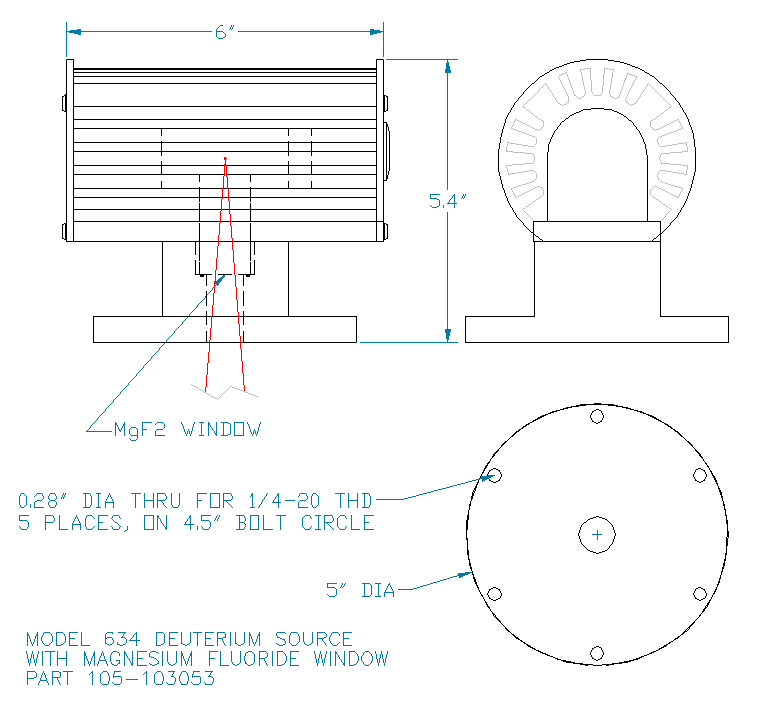 The Model 634 Deuterium lamp features a Magnesium Fluoride window, 1mm diameter emitting plasma and ~f/6 output. The source system includes cables, lamp housing and a power supply for lamp operation. This source is useful for vacuum ultraviolet (UV) and deep UV operation. Output between 380 and 165nm is continuous; below 165nm, molecular lines predominate. Because the sealing window is polished Magnesium Fluoride, cut with its optical axis perpendicular to its face, the source works to wavelengths as short as 115 nanometers. The Model 634 Deuterium lamp is available as a calibrated standard of spectral radiance. The calibrated Deuterium source comes with complete documentation. Source emission is measured every nanometer from 115 to 400nm. Abstract: [Data from obsolete end-on lamp] Wavelengths of the individual fine-structure components of the n 5 1–2 (Lya), n 5 1–3 (Lyb), n 5 1–4 (Lyg), n 5 1–5 (Lyd), n 5 1–6 (Ly«), n 5 1–7 (Lyz), n 5 2–3 (Ha), n 5 2–4 (Hb), n 5 2–5 (Hg), n 5 2–6 (Hd), and n 5 2–7 (H«) transitions of H and D are determined from theoretical values for the binding energies. Theoretical line strengths are used to obtain recommended values for the peaks of unresolved blends of these components as likely to be observed with discharge light sources and spectrometers with low to moderate resolution. Abstract: [Data from obsolete end-on lamp] A method is described for measuring the spectral radiant power of VUV and soft x-ray sources using the electron storage ring BESSY as a radiometric standard source of calculable spectral radiant power and degree of polarization. An ellipsoidal grazing incidence mirror stigmatically images the stored electrons or the source under investigation in equal optical conditions into a toroidal grating monochromator. 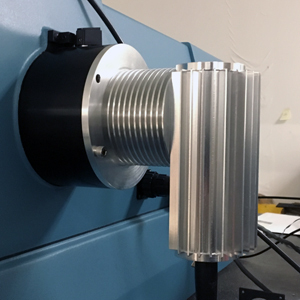 The monochromator can be rotated around its optical axis in UHV conditions to account for different degrees of polarization of the two sources. The accuracy presently available with this method is demonstrated by a measurement of the spectral concentration of radiant intensity of a laser-produced tungsten plasma in the wavelength range between 7 and 100 nm with an overall uncertainty of 10%. A detailed analysis of the contributions to this uncertainty shows that the major part of it is caused by the presently uncertain knowledge of the polarizing properties of the radiometric instrumentation and by the uncertainty of the correction procedure which accounts for the influence of higher diffraction orders of the monochromator grating. The results of the radiation measurements of the laser-produced tungsten plasma let us expect that this source type has the potential to serve as a radiometric transfer standard in the VUV and soft x-ray range below 100 nm. Abstract: [Data from obsolete end-on lamp] The electron storage ring BESSY is a primary radiometric standard of spectral irradiance, which has been used for calibration of deuterium lamps as radiometric transfer standards of spectral radiance in the wavelength range 115-350 nm. The radiometer used for these measurements is described in detail. 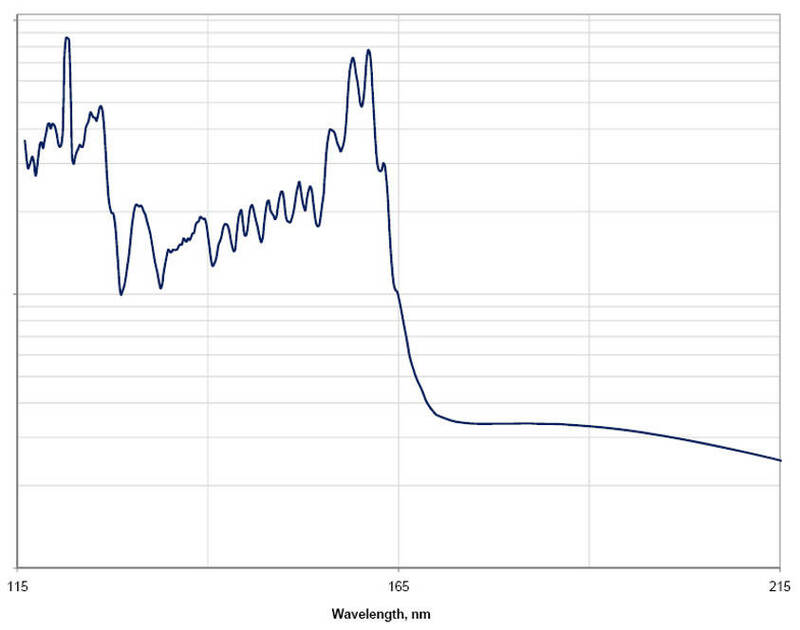 For Lambda > 165 nm the uncertainty of the spectral radiance of the calibrated lamps is < 3%.